I know school just ended and some of you are still going strong. 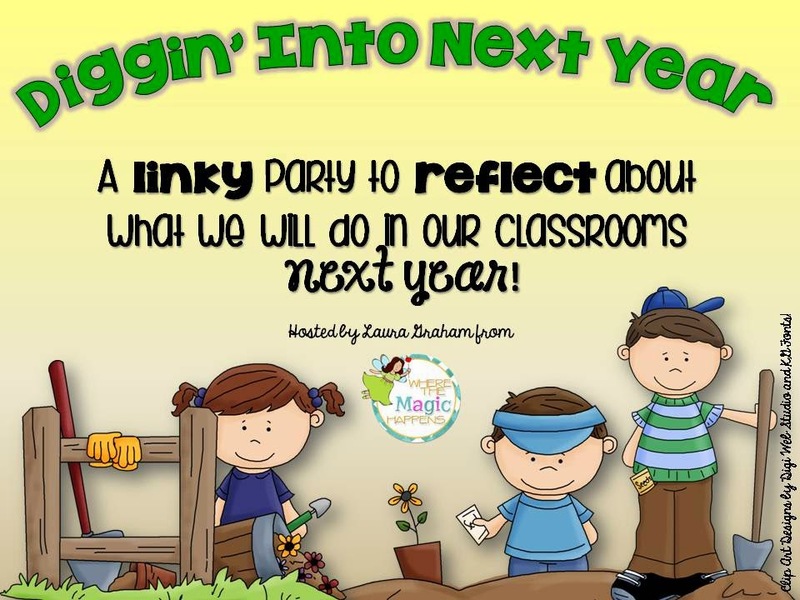 I’ve teamed up with some of my favorite bloggers to provide you with a SUMMER LONG linky with tips and tricks on how we run our classrooms and who we are going to prep for next year. 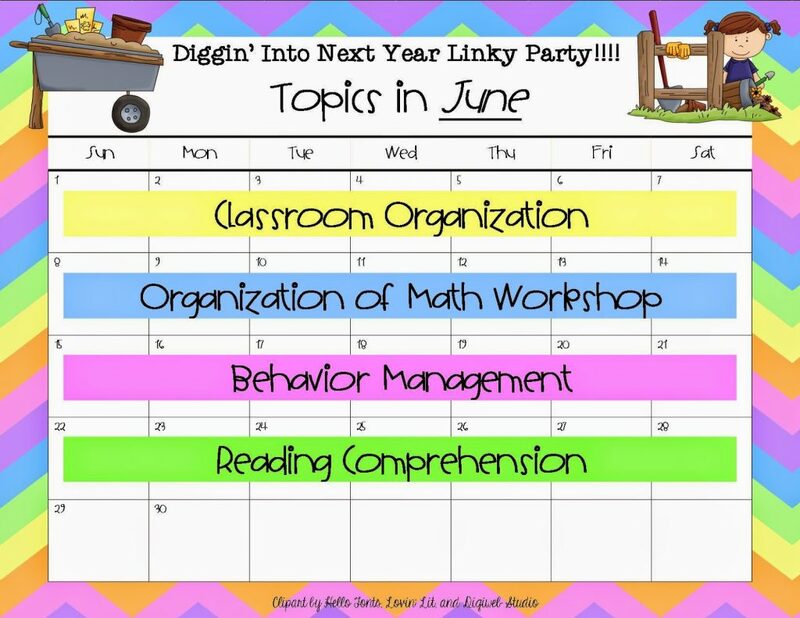 I’ve teamed up with some of my favorite bloggers to provide you with a SUMMER LONG linky with tips and tricks on how we run our classrooms! 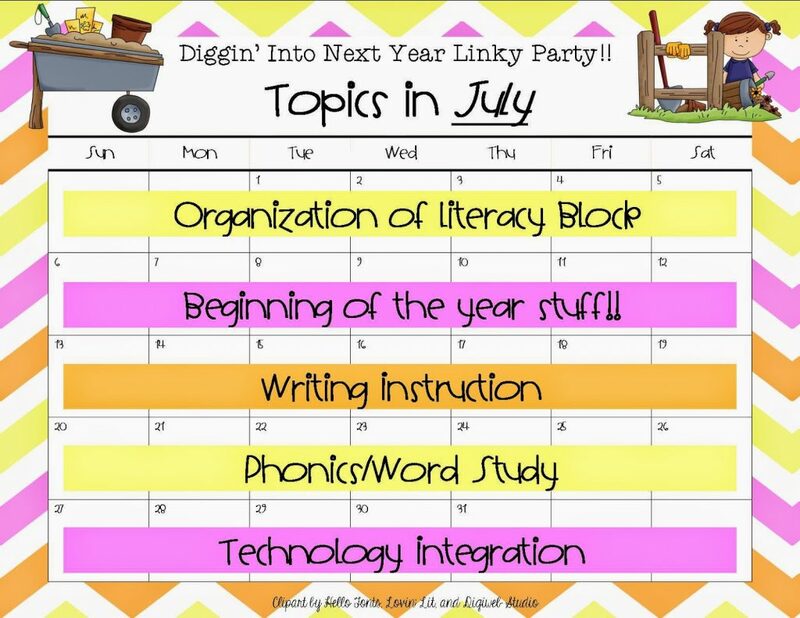 Each week we will be discussing different topics from organization to guided reading. Here is a closer look at our calendar. 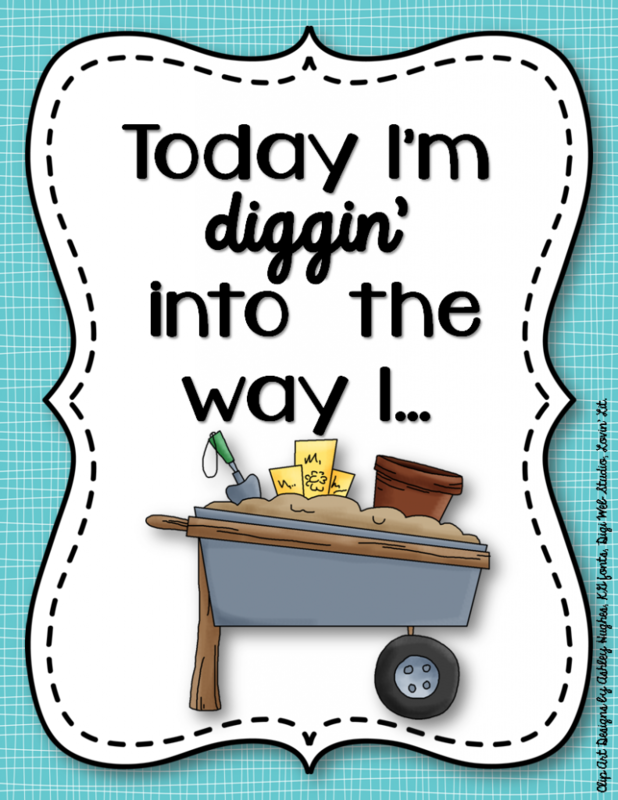 This week I’ll be sharing how I organize my classroom. Now, I’m not the best at giving organizational advice but I try hard. It’s my goal each year to be better at keeping things in order. I’ve made a lot of progress since my first year. 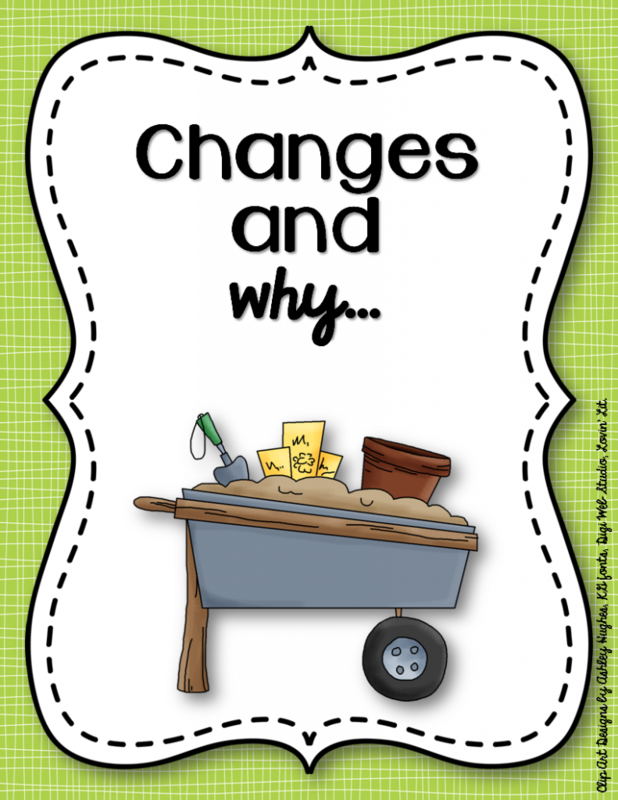 As I was taking down my classroom yesterday (they are painting my walls this summer so everything had to come down) I was brainstorming ideas on what I wanted to keep the same and how I wanted to change things up. (Since I had to take everything down, I’ve pulled a lot of pictures from previous blog posts because I procrastinate and forgot to take some pictures before hand.) 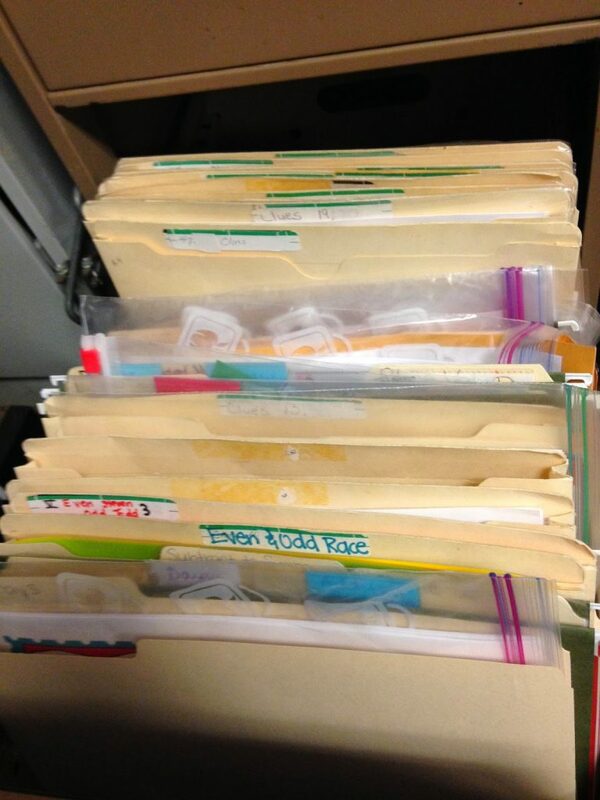 If I could give any organizational advice, it would be to label EVERYTHING! This will not only help you but the kids and comes in hand when you have to have a sub. 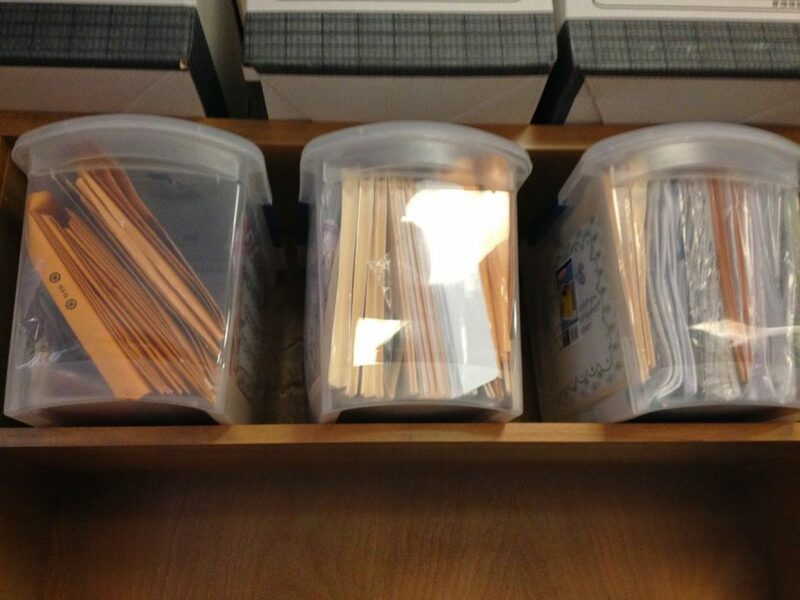 My favorite organizational tool is my weekly drawers. In previous years, I used different colored folders. I bought this cart at Sam’s last summer. I have a drawer for each day of the week. All of my copies for the day go in here. Then I have a drawer for copies next week, file, copy, grade and extra. If you’d like my zebra and glitter labels you can get them here for FREE! 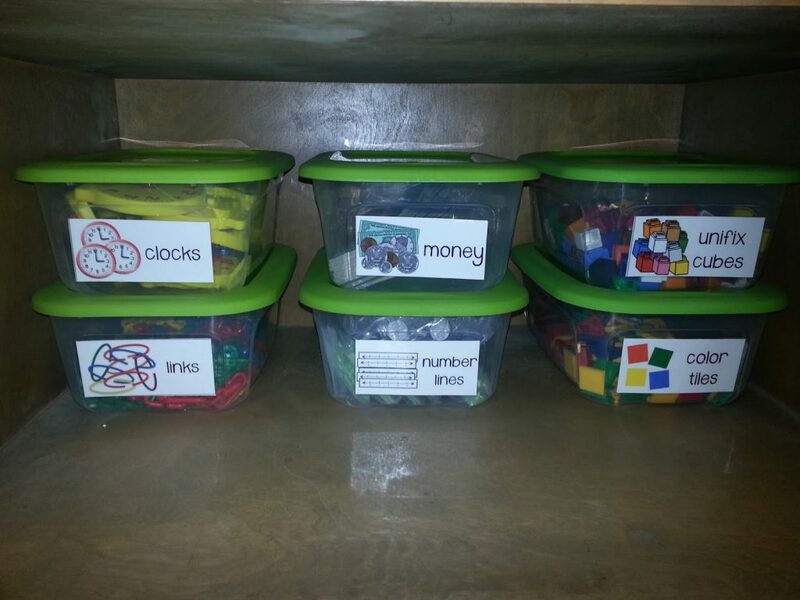 I just got all of my math mainpulatives labeled this year and loved it. 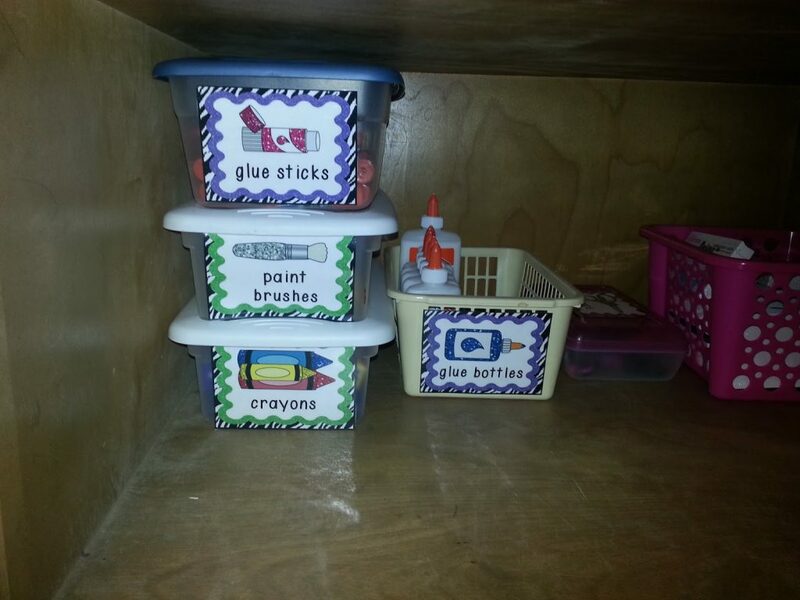 My kids could easily find something if they needed it and my shelves were NEVER MESSY! Hello! Big plus! 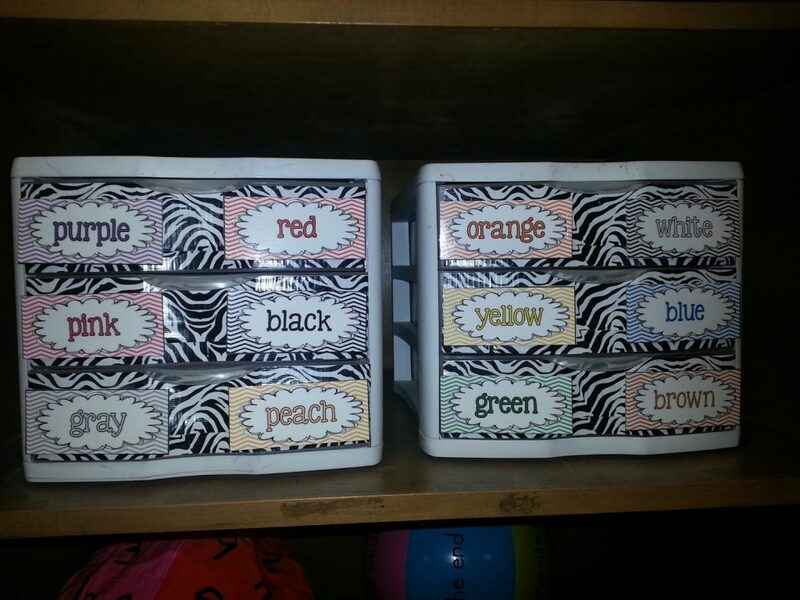 I bought these awesome storage boxes at Family Dollar for a $1! They are really sturdy. These labels come from my friend Frogs and Cupcakes! You can get them here! 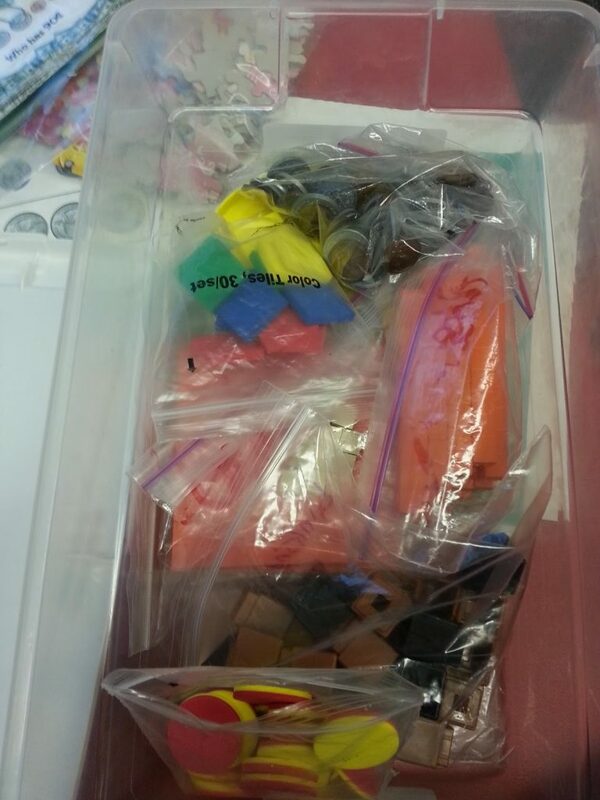 I like how the containers are clear so the kids can see what’s inside them. 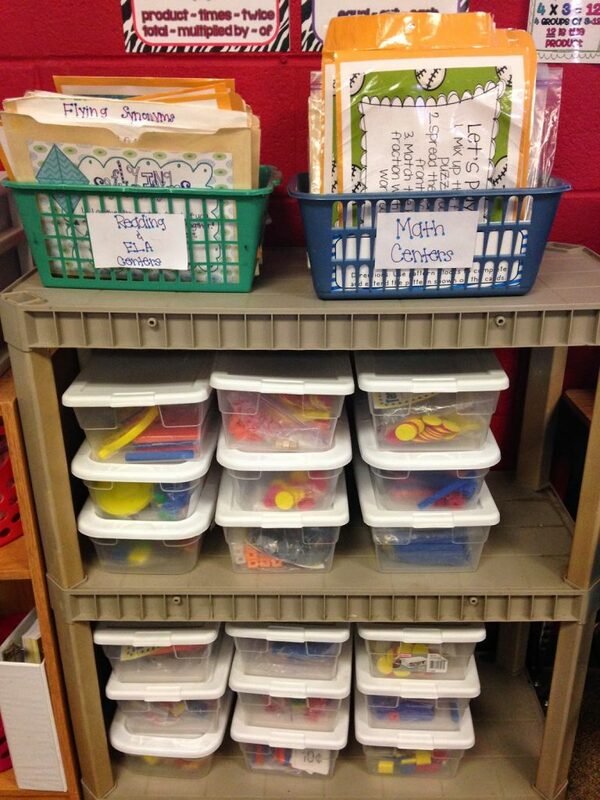 Speaking of math manipulatives, I use math tubs. These are a time saver all year long. Each tub includes all of the same materials, this way no one is arguing over boxes. Here is what they look like. For reading we use Journey’s which was brand new to me. 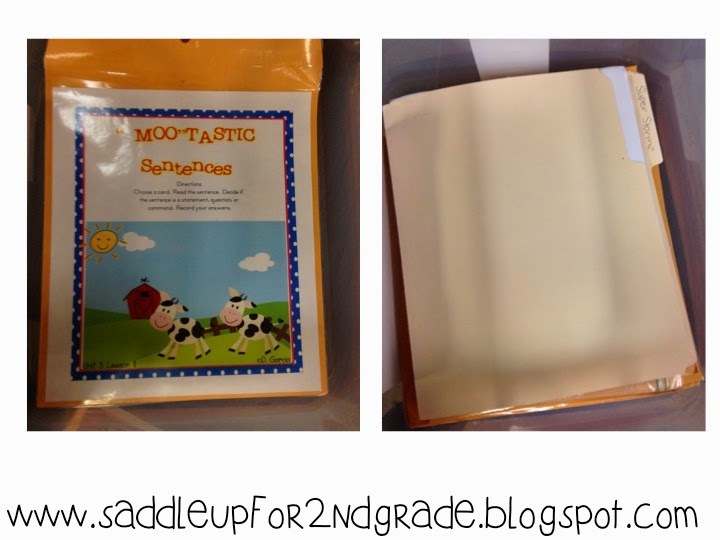 I use resources found on TPT to help supplement. If you use Journey’s, you can check out The Bubble Blonde Teacher and Twirlybird Teaching. 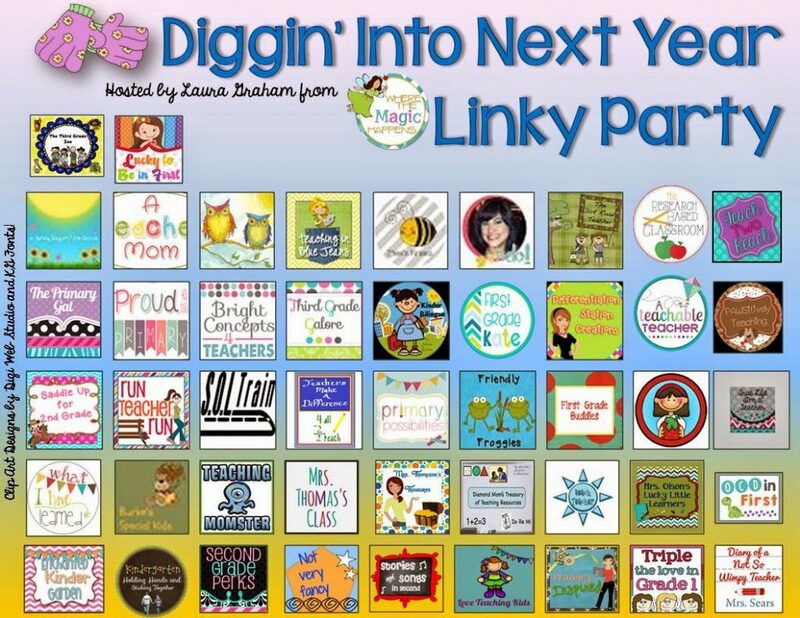 Their resources are fabulous and have been a total life saver for me this year. 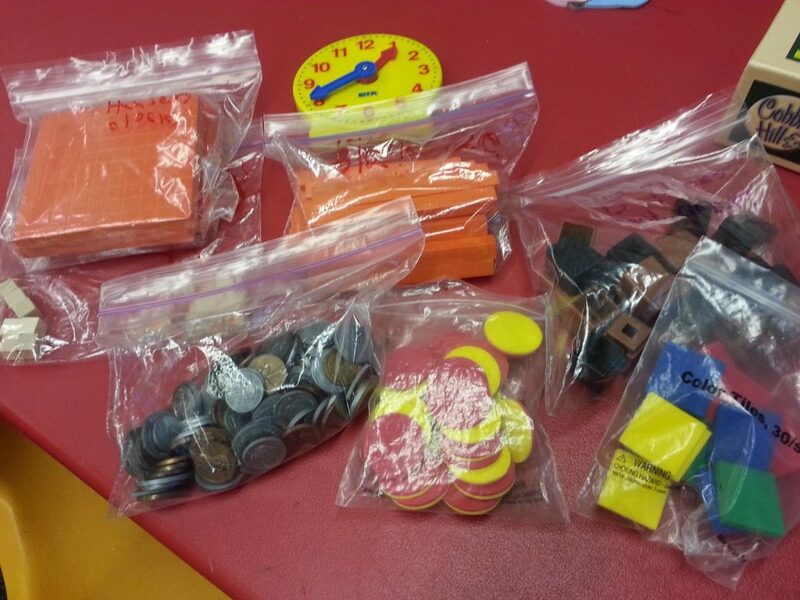 For each unit we cover, there are task cards and centers for each story to cover the skills we are learning. At first, I was just keeping everything in a manila folder and storing it all in one of my filing cabinets but then it got a little overwhelming. I thought to myself, I’m spending so much time getting all of this together. I want to make sure I don’t “lose” any of it for next year. 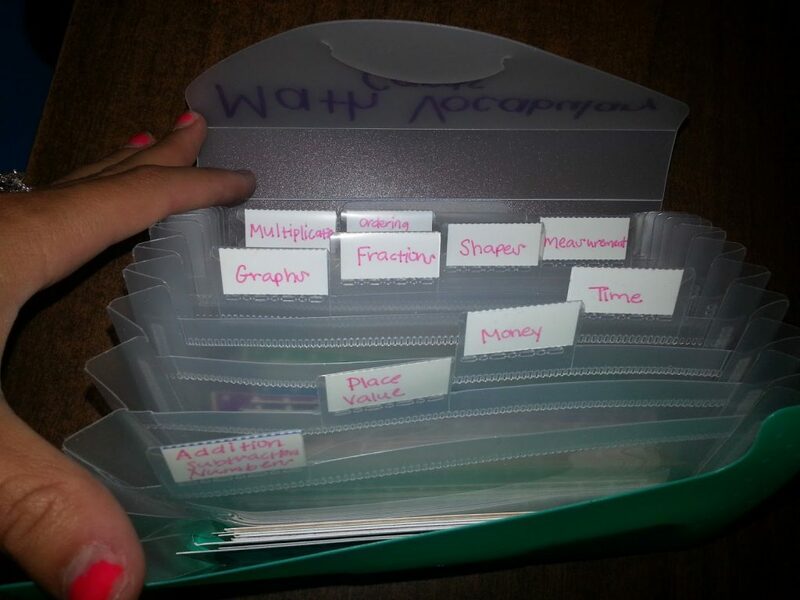 I wanted a way to organize all of my materials so that everything is ready to go for next year. Here is my solution. I bought these storage containers at Wal-Mart for about $7 a piece. Each container holds all of my materials for one unit. 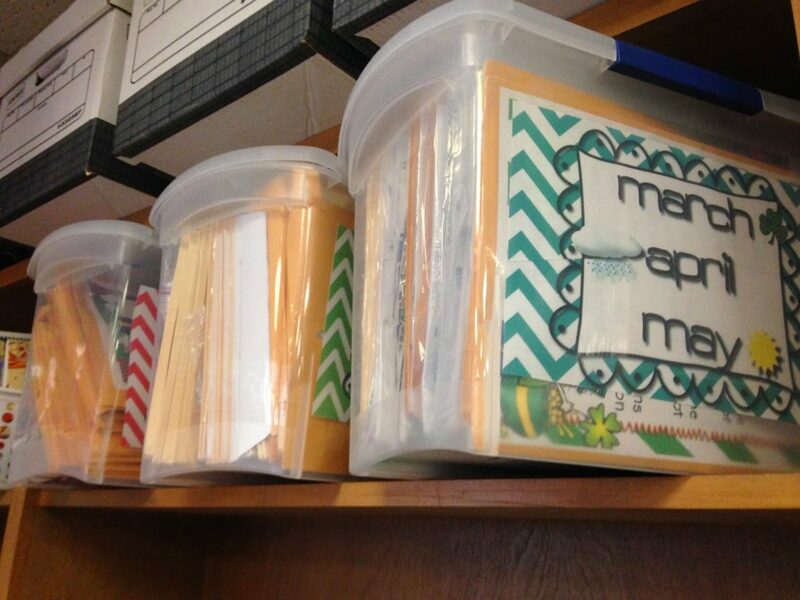 Inside you’ll find a file folder with lesson printables and centers to go with each skill being taught. This way I know where everything is and I can easily pull something to review skills as needed. Hopefully this will help me keep track of everything. 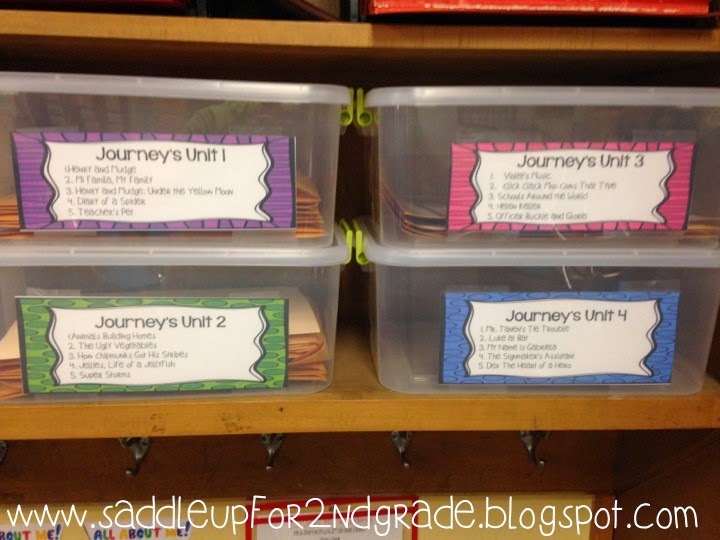 If you use Journey’s and would like these labels, you can get them by clicking below. I only made labels through unit 4 because I’m not sure if we will get past it or not. Only 10 more weeks of school! I’m providing a PDF file of the labels that were shown above and an editable file you can use if you use a different curriculum or want to add more past unit 4. *Note the font might appear differently in the editable version if you don’t have the font I used installed on your computer. I just wrapped up my fourth year of teaching. 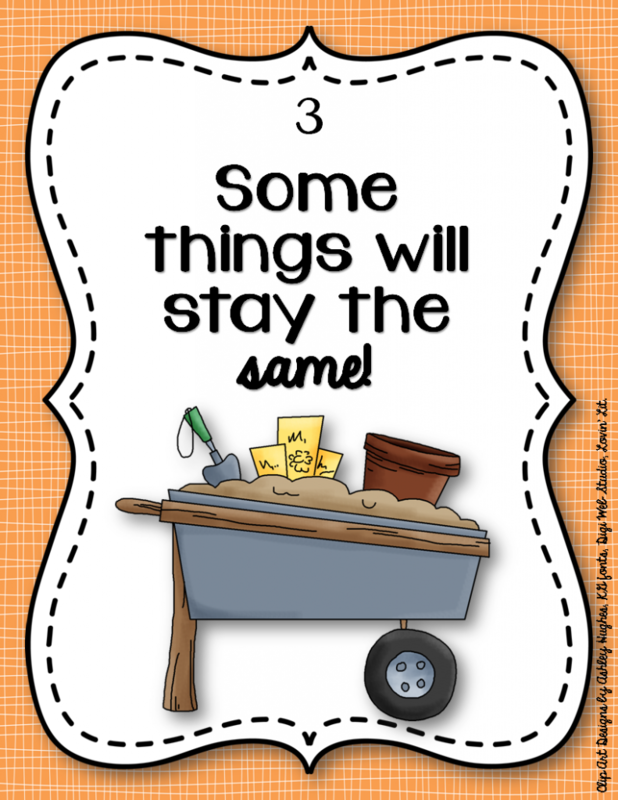 Within those four years, I’ve been in three different classroom. I’ve had to completely redo my room each of those years. Including this upcoming year since they are painting my walls, everything had to come down. 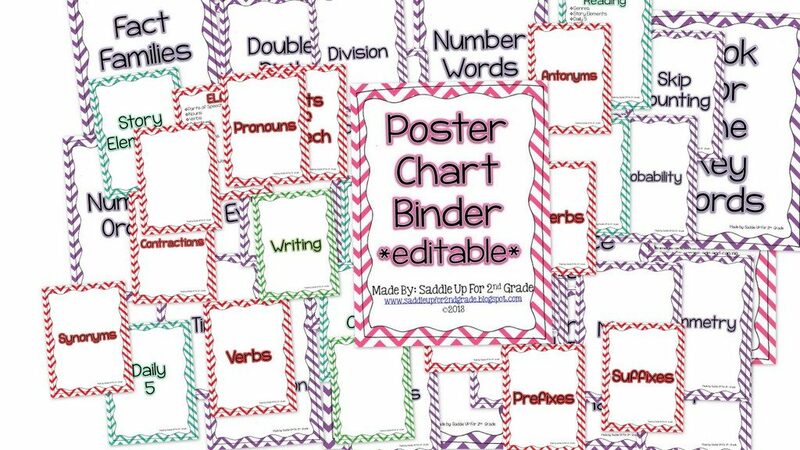 I love the way I organize all of my anchor charts. It was a hassle to dig around in my files trying to find the ones I needed so I created the chart binder to store everything in. It has been a life saver. I placed all of my posters in the corresponding sleeves. 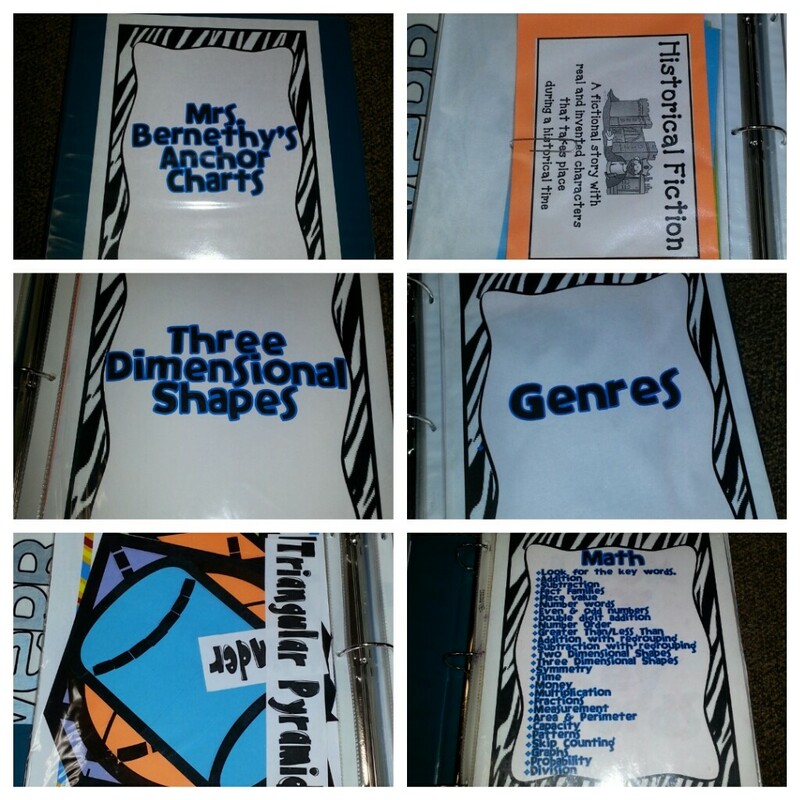 Now ALL of my posters are located in one binder. Its so easy to find what I need. Wal-Mart and they hold all of my monthly themed centers. This make them so easy to change out each month. Something I’m going to change. This will be a big project for me this summer. 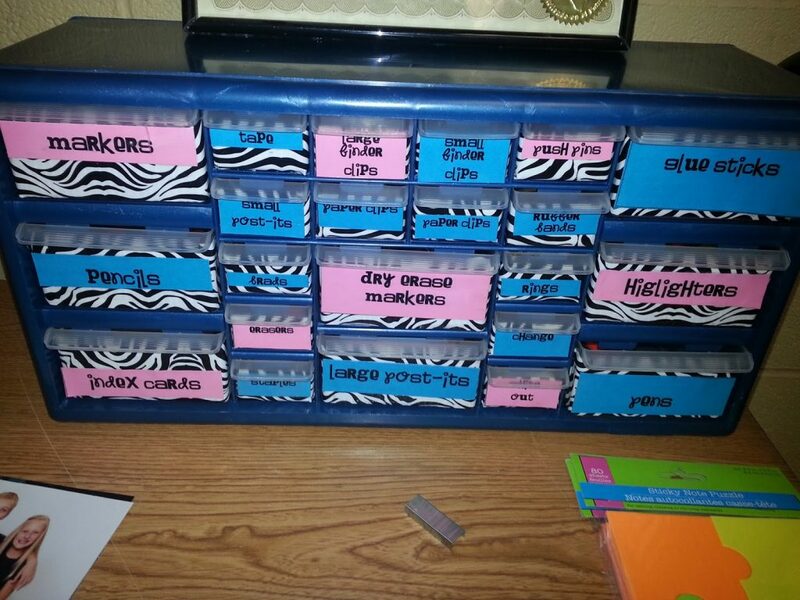 All of my subject centers are stored in a filing cabinet and sorted by subject/topic. Look at this big mess! 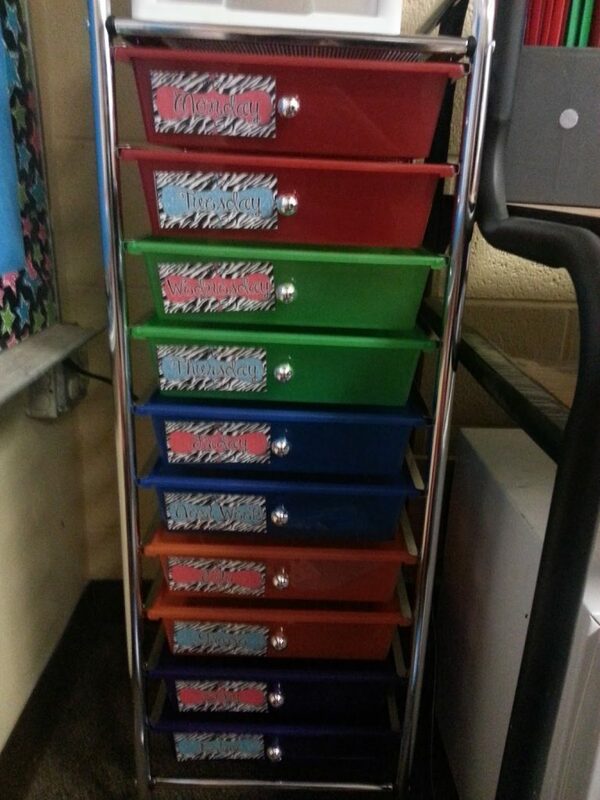 You know that colored cart you saw earlier in the post…the one I use to store my weekly papers. I found two more of those at a garage sale a few weeks ago for $1 a piece. SCORE!!! 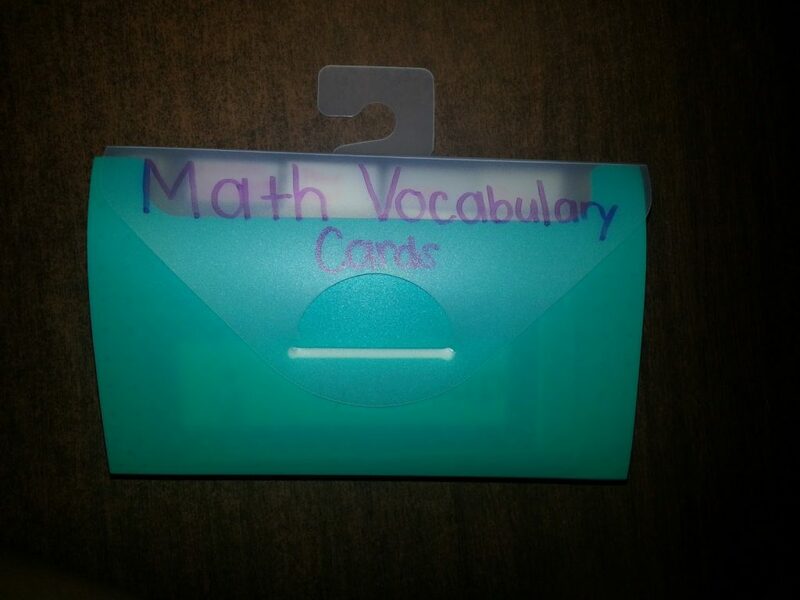 I’m going to use one for math and one for reading/ela. Each draw will hold different topics such as addition and subtraction, nouns and verbs, prefixes and suffixes. I have three filing cabinets in my room. Two are big and one is small. I’m hoping to move my smaller filing cabinet to my home office so this will help clean up some space. I’ll keep you posted on how that goes. That’s all of my tips for now. I’m have plans to rework something but don’t want to give it away yet incase they don’t get done. 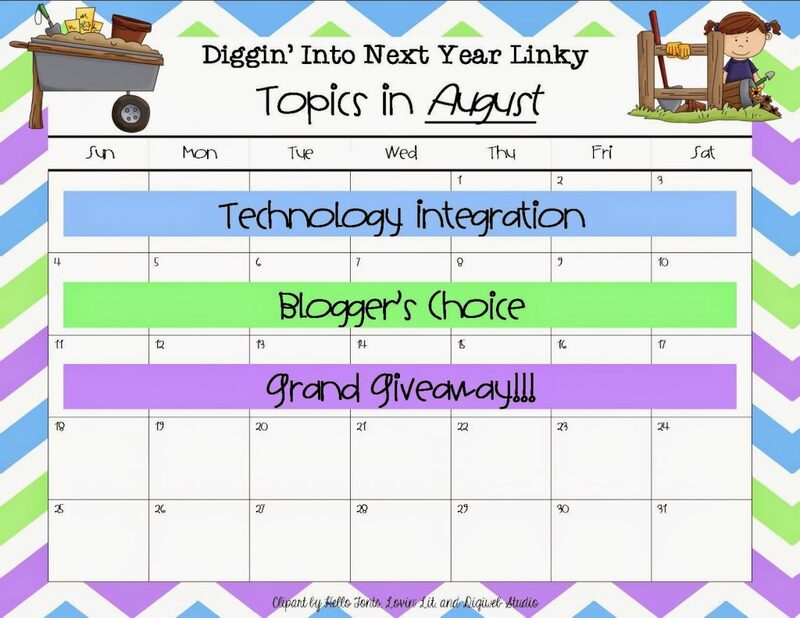 Click on the image below to check out some other great tips from great bloggers!